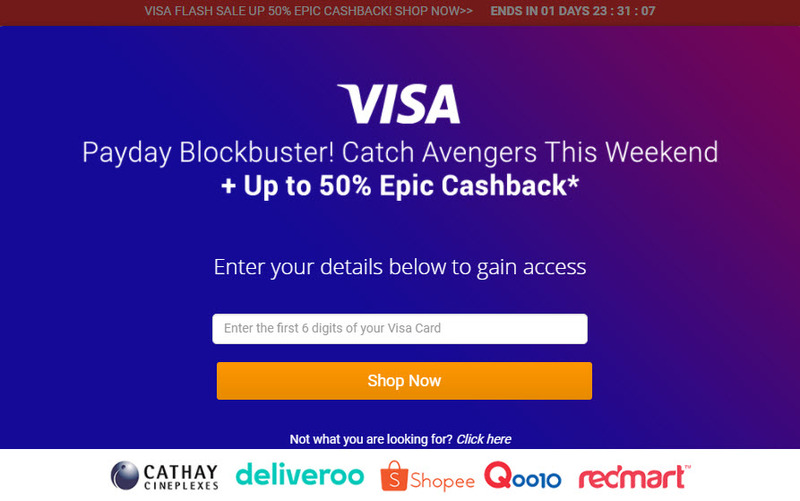 ShopBack Visa Promotion for Cathay Cineplexes This Weekend - 50% Up to $10! 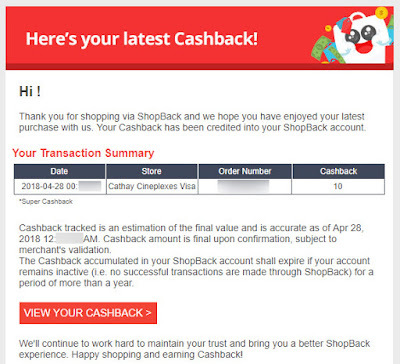 If you have not heard of ShopBack, you have been missing out lots of cashback opportunities! What is ShopBack? It is a website/mobile application which directs traffic to the relevant online shops such as Lazada, Expedia, etc. The merchants reward them with a commission for referring you to shop on their site and instead of keeping the rewards all to themselves, they share it with you! Once you have accumulated at least $10 in the account, you will be able to redeem it and transfer the cashback to your bank account! ShopBack is having a Visa flash sale this weekend (Valid from 27 Apr 2018, 0:00 - 29 Apr 2018, 23:59)! 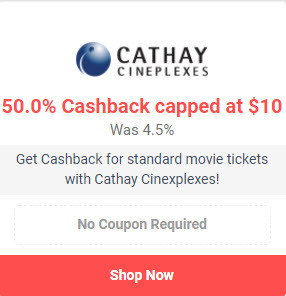 The most attractive offer is the one for Cathay Cineplexes where one can get 50% cashback up to $10! This is perfect timing because we can all catch the long-awaited Marvel Studios' Avengers: Infinity War movie at a much cheaper rate! Not forgetting Cathay has the best sweet popcorn (genuinely our opinion, nothing is sponsored here) as compared to the rest. lol. - Valid for first 500 daily orders only. Once the limit is reached, a page banner will be displayed as fully redeemed. 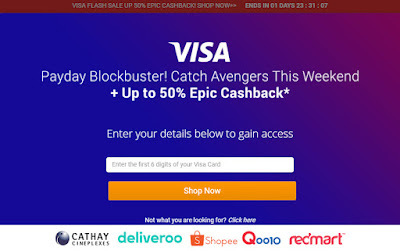 If you are already an existing ShopBack user, simply head over to https://www.shopback.sg/visa. If you are new to ShopBack, you might want to consider using our referral link where we will each get $5 after you spent $25. Once again this is the perfect opportunity because purchasing 2 tickets ($13 x 2 + $1.50 = $27.50) will mean you will be eligible to withdraw $15 cashback almost immediately! Better catch it this weekend because there will be lots of friends/colleagues spoiling it on Monday. Hahahaha. I blogged about Ezion a few months back - Bleeding Stocks - Ezion [Part 3] after it was suspended on 8th August 2017. It has resumed trading last week on 17th April 2018, opened at $0.245 and even reached a high of $0.255! CZM was asking me what would be my plan when Ezion resumes trading. I told her confidently that day 1 will be a bloodshed as I foresee everyone will be dumping and selling their shares. My plan was to hold it, be hopeful and see how things go. Surprisingly, it was beyond my expectation and it actually traded higher! Without any hesitation, I submitted a sell order and sold all of it at $0.225. Investing in stocks is never easy and one does not always make money. My total capital was $6,167.70 and I am pretty glad that I manage to get back $2,222.26 after ~ 4 years. 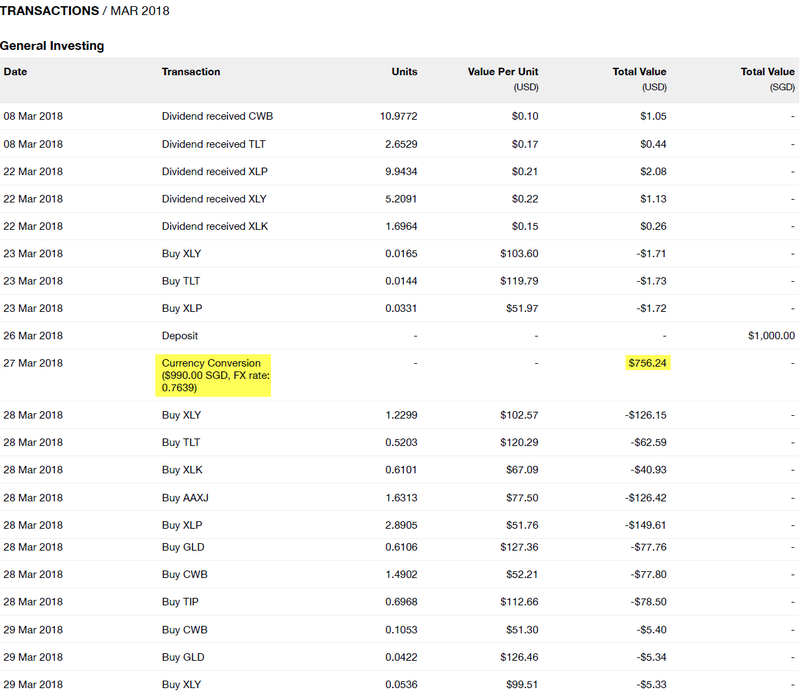 I lost in total $3,939.30 including commisions which translate to a total loss of -63.9% and an annualized loss of -37.9%! It could have been much worst - the latest closing price is $0.152 on 25th April 2018. Looking at their 2017 Annual Report, the shares are now worth a lot lesser than it was one year ago. The equity attributed to shareholders is just US$304,826,000 as compared to US$1,315,384,000 partly due to the ridiculously large impairment losses of US$697,322,000 in their Plant and Equipment among other things. Furthermore, the decrease in cash is not proportionate to the decrease in liabilities too! NAV has decreased by 76.8% from US$0.6343 to US$0.1470 (~SG$0.1940 using an exchange rate of US$1:SG$1.32). 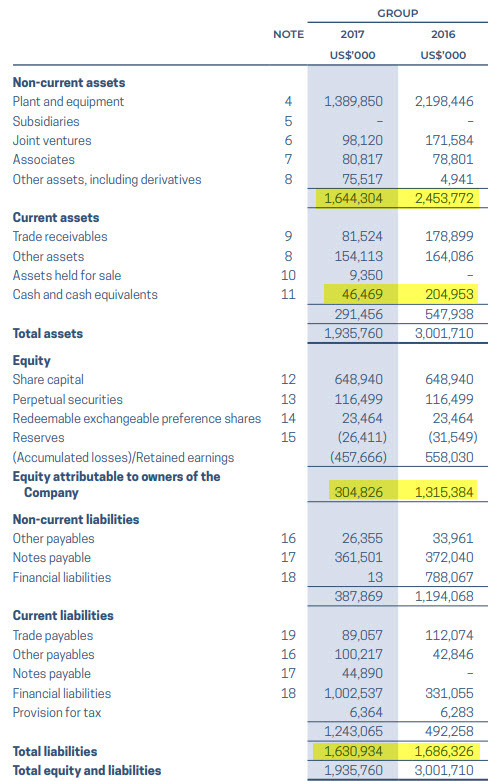 Regardless, the US$1.6 billion debt is an exceptionally huge one that will probably stick around its balance sheet for a long time and I am not too optimistic about it with a gross profit of US$1,804,000. Even if Ezion successfully multiplies its gross profit by 10x or even 100x, it will never be the same again. Do not make the same mistake as I did when I first started investing 4 years back - buying based on analyst's report recommendation. 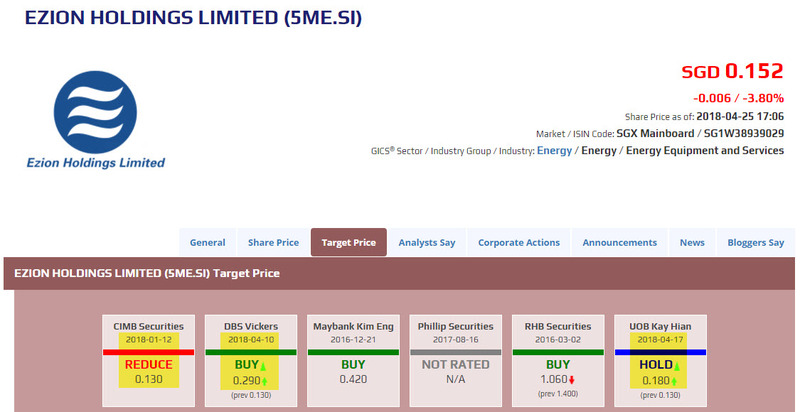 Look at what DBS has done again with a BUY recommendation and a price target of SG$0.29 where the valuation is done at 1.4x FY2018 PB?! It is just so wrong! After all the drama, why would anyone still value/price Ezion at a premium? One can either continue to be hopeful or cut loss, take whatever there is now. Assets can be impaired but liabilities will definitely remain. Good luck to the remaining shareholders! I blogged about how we use miles to redeem one-way SIA Suites air tickets to the United States, New York previously - Redeeming KrisFlyer Miles for Singapore Airlines Suites = 38.6% Cashback! We booked an Alaska Airlines flight from New York to San Fransico for US$246.62 (SG$333.40). CZM and her family have this Travel Fund where they will contribute on a daily basis - working adult contributes $2 per day while the student contributes $1 per day. I thought this is a pretty interesting idea/way of managing money too. Long story short, they have been saving for 4/5 years with the goal of traveling to New Zealand. CZM asked me to tag along to enjoy the economy of scale as there will be no additional cost for things such as car rental and accommodation. A 2 weeks New Zealand vacation for $2,800 (all expenses included) seems like a pretty good deal? We paid the second deposit to the bridal shop, Rico-A-Mona after selecting the suits and gowns for both the prewedding and actual day and bought some random stuff/props for the pre-wedding photoshoot. My food expenses are exceptionally low because I stay with my parents! Most of it is incurred when I am out with CZM. The $69.97 is the installment for Surface Pro which I got about 2 years back. One of my hobbies is money/notes collection and I expense it off because I kept some nice notes which I received during CNY. The hobby started when my dad gave me his collection which included a $50 orchid series note! I would always pay for CZM's cab ride home during night time since I am too lazy to send her home. That was one of our agreement. lol. Went to a temple and donated. There was the $8 million ToTo draw. Shared $10 with CZM and the rest with colleagues. The fastest way to retire did not materialize. lol. Watched Black Panther + popcorn. 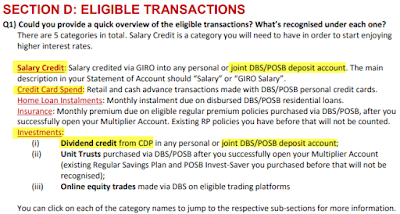 Some of the readers might know that we have changed our bank accounts from OCBC 360 to DBS Multiplier when it was revamped last year and I blogged about it here - Free $5 for DBS Multiplier Account Holder. The free $5 is still available (until 30th June 2018)! 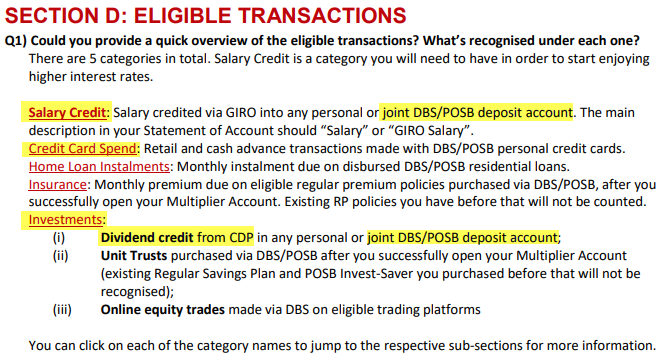 In my opinion, the DBS Multiplier is by far the most generous bank/account when it comes to fulfilling/meeting the various defined categories (credit card spend, home loan, insurance and investments). Firstly, it awards you for having a higher salary and there is even a way to double it through the use of joint account! I shall elaborate further later. Next, it does not encourage spending, even a $1 credit card spend will mean that one can meet that category (proven - this is what CZM has been doing). 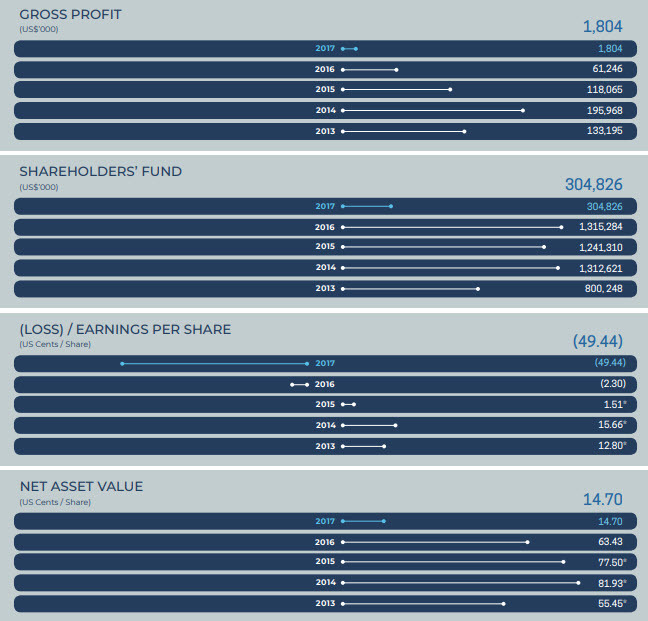 Last but not least, all/most of the investments category (e.g. OCBC 360 and SCB Bonus$aver) has been a scam which requires you to either purchase an eligible insurance product or invests in a unit trust with them - things which we will never do. Naturally, we dismissed the investments category for the Multiplier account when we first signed up for it. 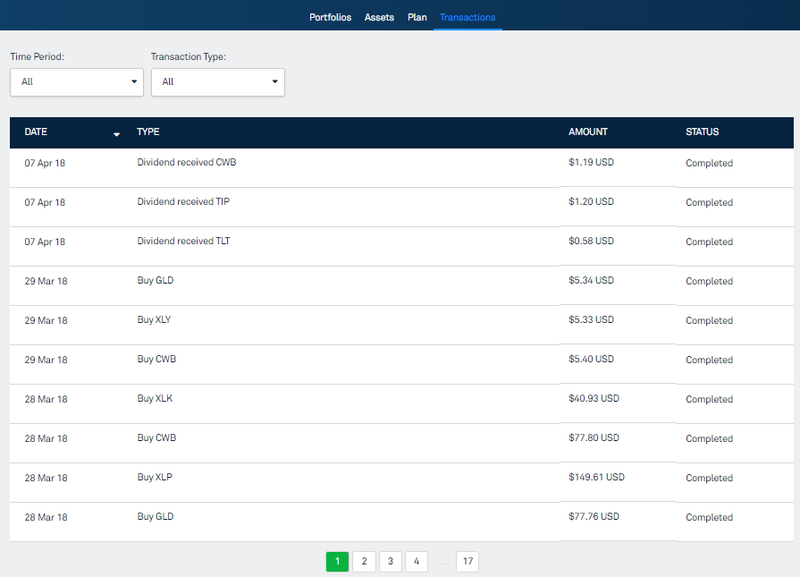 It turns out that the investments category can be met simply from dividend crediting from CDP. With this knowledge, I came up with a theoretical way (not proven yet, we will only know 7 months later. lol) to increase our interest! Open a joint account with your spouse/another half (If he/she does not exist, you can skip to the next step or find one quickly. Hahaha). You should have 2 Multiplier accounts + 1 joint account. The reason for having a joint account is because the total salary credited to the joint account will be considered as a salary credit for the Multiplier account. This could potentially bump the couple up to the next category (e.g. ≥S$2,500 to <S$5,000 to ≥S$5,000 to <S$15,000) which gives more interest! Furthermore, with 2 Multiplier accounts, the cap for the bonus interest is essentially doubled to $100k. One thing to take note of is that the joint account should only be used as a "pass through" account. Keep the minimum balance (we are looking at POSB Everyday Savings Account with $500 minimum balance) needed and transfer the relevant amount/salary to the Multiplier account because the interest awarded is based on the balance in the Multiplier account only. Build a bond ladder using 6 SSBs (Singapore Saving Bonds). 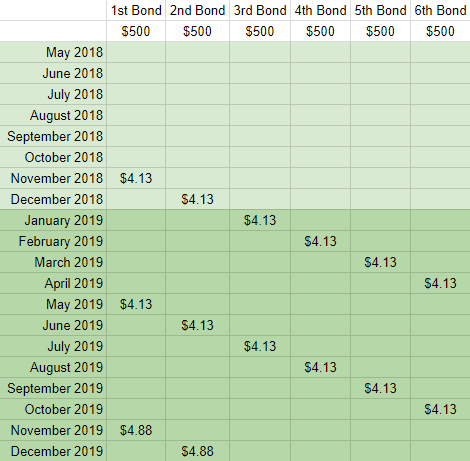 Bonds pay a fixed coupon (similar to stocks paying dividends) at fixed interval and has a maturity date where one can get back the principal/invested value. A bond ladder is made up of multiple bonds that pay coupons at different intervals with different maturity dates. This is a more conservative strategy/form of passive income for retirement. This is just a quick introduction, do read up more on bonds elsewhere! I believe everyone should be familiar or have at least heard of SSB. It is issued/backed by our government and unlike the normal/actual bond, it will not be affected by the rising interest rate environment. Bonds typically trade like stocks with buy and sell price and its price will fall when interest rate increases but you do not have to worry about that with SSB. The minimum investment per SSB is $500 and the transaction cost is only $2. 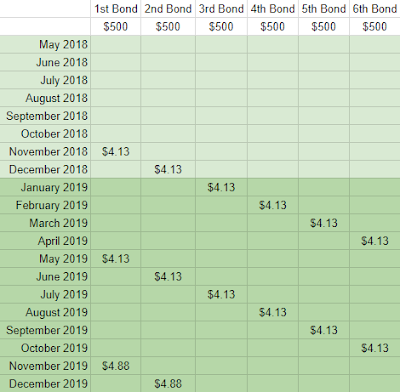 To build a bond ladder, simply buy a $500 SSB for the next 6 months. Since the SSB pays coupon/interest every 6 months, you will receive dividend crediting every month for the next 10 years! lol. You will also need to go to the SGX CDP portal and ensure that the account specified in the Direct Crediting Service is the joint account. I updated the StashAway mobile application and was playing with it. Holy! 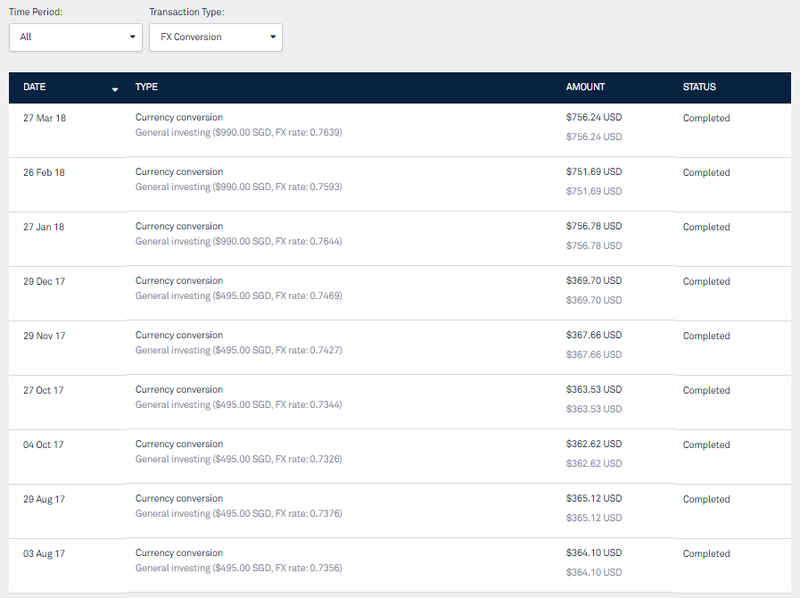 They have finally revamped the "Transactions" tab. Not sure if they did it much earlier or recently but I only discovered it today. Michele and Freddy when we met again earlier this year in StashAway's new office. I am pretty sure I am not the only one complaining/giving these feedbacks but I am glad they have made the relevant changes to these things that annoy the hell out of me. In my last update (StashAway - March 2018), I highlighted that StashAway is finally proving the information on the currency conversion. At the back of my mind, I was thinking it would be great if the same information can be provided/displayed for previous months and my wish was granted. lol. Do you see a difference? It now contains the real/actual transactions such as buy, sell and dividends! 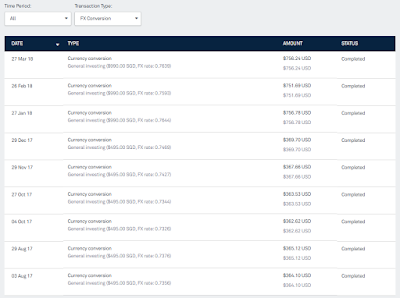 I can also filter the transaction type to see transactions which I am interested in. With the above information, I quickly compare it against the historical exchange rate on XE. The "close" rate from XE is captured as of 00:00 UTC on that day. It seems that the exchange rate provided by StashAway are pretty decent and are definitely much better than the banks and money changers! A difference of about USD $1.67 for exchanging SGD $5,940 to USD $4,457.44. The chart in the mobile application is interactive now and captures monthly snapshots. Interestingly, the web/browser chart is not interactive at all! KPO complaining again. lol. Based on my own tracking, the snapshot is most likely based on the market value for the last day of the month. Having seen how bits and pieces of StashAway changed over the last few months, I am pretty satisfied with it now. How do you find StashAway so far? Any other complaints/feedbacks? StashAway managed to raise another USD $5.3 million in their Series A funding round recently - Singapore's StashAway raises US$5.3M Series A funding round, will launch in new markets. This brings their total funding to SGD $11.1 million which is definitely an excellent piece of news. One of the main concern we all have is the possibility of the robo advisors going bankrupt/closing down which can be a showstopper preventing one from investing through them. Let's admit it, Singapore is a small market, hence the cost of investing through robo advisors are more expensive as compared to the United States or Europe. Expanding to other markets/countries will be beneficial in the long run. We all have a 50% chance of getting SGD $X in the Yth years so StashAway has to be profitable/operating till then. Based on the statement (31 Mar 2018), we lost -$62.58. 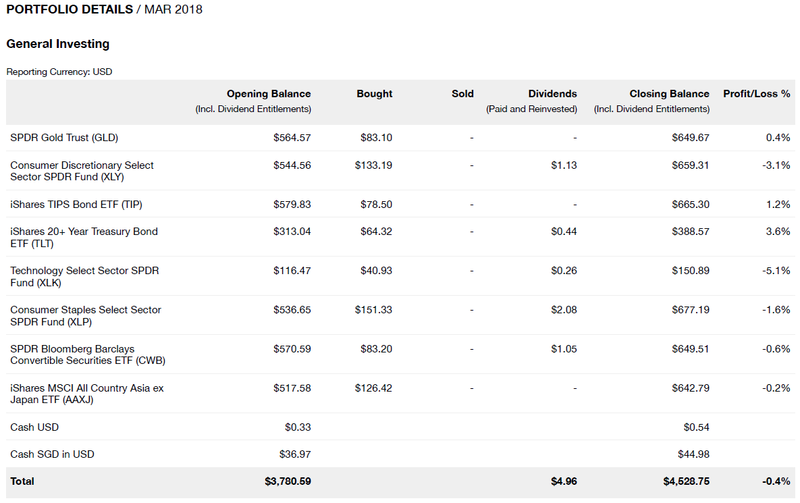 As of 4 Apr 2018, we lost -$67.65 mostly due to the currency impact -$91.39. Did you notice something very different this month? StashAway has finally decided to provide the exchange rate that was used to convert our SGD to USD! 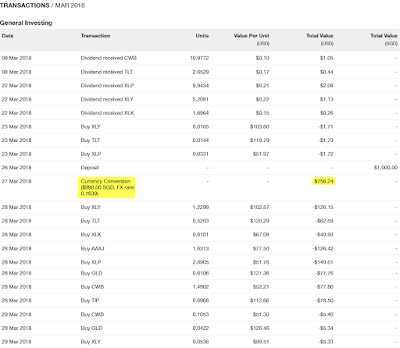 This month commentary: I have added another "model" to the comparison table - investing in Nikko STI ETF using SCB Priority Online Trading (no minimum commission). Not surprising at all, all the investments are in red/losing money! StashAway continues to be the biggest loser similar to last month - February 2018. Our portfolio increase by 2.70% to $323,073 - $10,401.71 of capital injection and $1,914.81 of capital reduction. Today is another bloodshed, the value of our portfolio decrease by >$5k in a single day. Are we worried? No :) Let me share an old but gold article by the Motley Fool - How You Can Reduce Your Chances Of Making Losses In The Stock Market. Make a guess? Have a long investing horizon! It seems that some of our readers/friends/colleagues have been demoralized by the market. Numbers do not lie! The probability of losing money in 1 day is almost equivalent to a coin toss. However, based on historical data, there is a 0% chance of losing money if you stay invested in STI for 20 years (1992 to 2016). Just think about why the insurance companies/banks love to sell you long endowment/ILP, it is easy money for them because they just have to share a small return with you while you provide them with the capital! I hardly sell stocks but I made the decisions to liquidate these two and redeploy the money because I believe Tuan Sing will be a better investment. Asian Pay TV Trust was a "legacy" investment. It was one of the stock which I purchased simply because the dividend yield was high when I first started buying stock in 2014. I was eventually punished as the dividend was unsustainable and the price fell accordingly when the dividend was cut. 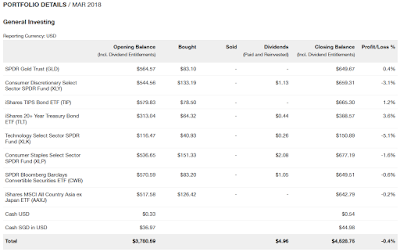 Fortunately, the dividends collected over the years was sufficient to cover for the capital loss and I ended up with an annualized return of 7.1% after ~4 years. I bought OKP last year and blogged about it here - StockResearchAsia Strikes Again - OKP Holdings Ltd. The future is slightly unclear for OKP so I have decided to let it go at a loss in order to invest in a better future/stock - Tuan Sing. The annualized return is -10.2%. Sysma was brought to my attention by StockResearchAsia. 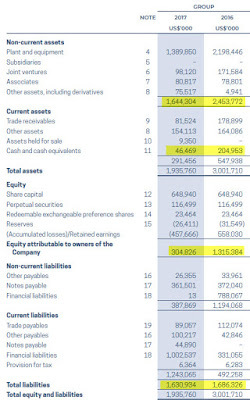 It is currently trading at a discount to its NTA (Net Tangible Assets) with a significant cash! The problem is that it has extremely low volume and wide bid-ask price. 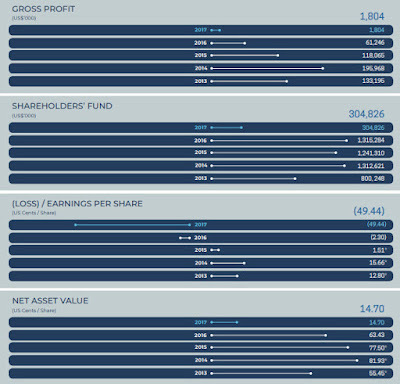 As for the rest, I have blogged about them individually and decided to average down given the weakness in share price. The UI is slightly misleading, showing green when it is losing money. lol. 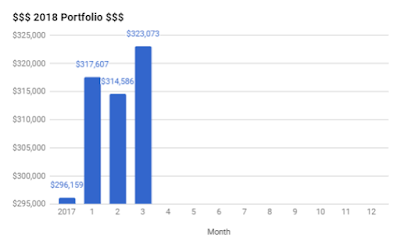 Took a quick look at our StashAway monthly statement and was pleasantly surprised! The exchange rate is FINALLY being captured! Good job StashAway founders. Hahahaha.